Behind Kar-Ben’s books are the clever, creative, wise, witty and wonderful people who write them. An author visit is a fun way to show kids that books and learning about Jewish culture, holidays and traditions matters. Many authors offer interactive programs with hands-on components to create memorable experiences. From board book authors who engage preschoolers and parents with rhyme and song to picture book writers who bring silliness and shenanigans to those with programs for older children on Jewish history, Kar-Ben’s authors inspire young minds to be curious and enthusiastic about Jewish life. Download an Author Visit brochure that includes author information and program ideas (pdf) or search the state-by-state listings below for an author near you. One Good Deed is a story about the power of mitzvahs bringing a neighborhood together. Following a reading, children will participate in activities and discussions that highlight the ways they can make the world a better place. With board books for very young readers, Jamie creates energetic and imaginative programs that share the joys of Jewish life with parents and children through storytelling, props, songs and more! Hot Pursuit #1 New York Times Best Selling author presents this inspiring story from the Civil Rights Movement. Take a high-energy trip around the world with folklore writer Ann Redisch Stampler. Through guided activities, students learn that everyone has interesting stories to share. Both an author and an illustrator, Becky’s interactive, hands-on workshop will help kids consider the link between words and pictures so they can create their own mini-books. While on a diving expedition studying sea urchins at the bottom of the frigid sea, marine biologist David Ginsburg wondered how he could bring Hanukkah to Antarctica where it was summer in December and there was no nighttime. David’s fascinating program includes a slideshow, real diving equipment, and a Q&A about his unique Hanukkah celebration under the sea. In a lively presentation using her cat puppet and slides, Joanne Rocklin will review the prayer and its meaning, as well as take the audience through the production of the book from the idea stage and first scribbles to the final color edition. An interactive Shehechyanu board game will be introduced, designed to be played in small or large groups. Reading this zany Purim retelling of the three little pigs tale sets the stage for making fun Purim crafts for a Purim parade. Internationally renowned klezmer musician Yale Strom offers an entertaining book reading and discussion, sharing the joys of music. Honorarium plus travel. Pamela gives students a glimpse into how books come to be, and many of her young fans say they want to be writers! Presentations to children vary by grade level and age, and last from about half an hour to an hour, with time for reader’s theater activities, questions and book signing. Program for parents and children including original rhymes, songs, finger plays and book readings. Sammy Spider craft projects, book reading and a slide show for children. Educator presentations on using Sammy Spider books in the classroom, how current events influence the author’s children’s book writing, and discussions on writing children’s books and storytelling. Rabbi Jamie shares her stories and leads a related activity that encourages children in their own Jewish spiritual adventures. For children ages 6+, Jamie offers an empowerment workshop, in which kids write and illustrate their own books. Joe Black is a congregational rabbi and an internationally renowned singer/songwriter. His dynamic music for children and adults has been shared with hundreds of Jewish communities around the world. He is available for readings and workshops as well as concerts—as a solo artist or with a full band. With books both serious and silly, Renee can create a dynamic program with a reading and hands-on activities. Read the story and learn how Joel created it as a way to exercise your own imagination. Program can be tailored to fit with Hanukkah-related cooking and art activities. Share in the joy and fun of Tu B’Shevat, the birthday of the trees, by giving thanks for the many wonderful things trees give us. Lights Out Shabbat Shabbat is special! Sarene Shulimson’s program includes a reading of her story about a boy and his grandparents spending Shabbat together during a Georgia snowstorm. Using all their senses, children make shadow puppets, create pretty havdalah candles and sniff spices. Objects—especially ones inherited from family members who lived long ago—can tell important stories. Join the author, an avid collector of Judaica, to learn about special lamp at the center of his story. Enjoy the first picture book about the Jewish holiday of Shemini Atzeret, which falls at the end of the fall harvest festival of Sukkot. Learn about this holiday and its accompanying prayer for rain (in Israel), which has gained recent attention due to its ecology-based message. This New York Times bestselling author will help audiences explore and appreciate the life and contributions of unconventional spy Moe Berg. Carrie loves sharing strategies for writing with young audiences. Half-day or full-day presentations include demonstrating how to create a digital painting from a Sesame Street book from sketch to finish, as well as a demonstration of drawing various Sesame characters, and then allowing students to complete their own drawings of Grover. Together we will read this rhyming retelling of how God created the world, and we will have interactive fun hunting for hidden Hebrew letters that make up shapes in the book’s colorful images. As an activity, we can appreciate the Hebrew alphabet by transforming letters into a menagerie of animals. Hare and Tortoise Race Across Israel: Great for Yom Ha’atzmaut or any time of year, this interactive program will pique children’s interest in creating their own books based on familiar stories. The program includes a hare and tortoise guessing game, as well as a discussion of how authors adapt known stories to create original books—and how kids can do the same! And Then Another Sheep Turned Up: Laura Gehl’s high-energy program includes rhyming games, acting out a busy Passover seder with not enough chairs to go around, and—of course—counting sheep! Why does the moon always disappear during Hanukkah? Find out about the moon and some interesting and multicultural Hanukkah customs. The program includes a book reading and discussion. Experience Shabbat through a book reading and art project. Kelly’s passion is teaching creative writing. As in the case of her picture book, she has innovative and time-honored ways to free children’s creativity, and allow them to adapt stories of their families and Judaism creatively. Kelly has taught creative writing from ages 5 through graduate school, and is a seasoned presenter. Read this charming book with the author and be inspired to roll up your sleeves and do a community service project in the same spirit of the story. Programs specific to each book include hands-on activities and discussion. After an author-led read-aloud, Jane will present a program that can be focused depending on audience needs to include hands-on activities like crafts or walking students through the writing process. Learn about the Sukkot holiday ritual of the lulav and etrog, the Abayudaya people and Jewish diversity, or the process of writing a book. Preschool programs will include Sukkot-themed crafts and about how to shake (and share!) the lulav and etrog just like the animals in the story! Like Aviva, the star of Lesléa Newman’s children book, My Name is Aviva, everyone’s name has a story. After reading My Name is Aviva, Lesléa Newman will lead a writing exercise, during which each child will write a simple poem about his or her name. Solve the mystery of the missing gourds and uncover the mischief of some sneaky squirrels! Susan Axe-Bronk reads her suspenseful ecofriendly Sukkot tale. Presentation can include crafting cool sukkah decorations. Join Jane Sutton to explore the real meanings of holidays by reading her hilarious books and participating in crafting and silly games. Boys and girls are invited to come dressed as princes and princesses when Amy Meltzer presents her book The Shabbat Princess. Her presentation includes a book reading, Shabbat-related art project, and a costume parade! Jacqueline Dembar Greene, author of American Girl series Rebecca Rubin, reads her story about a bomb sniffing dog from Israel, and explores the lesson of what it’s like to be a new student in a new country, when you are just learning to speak the language. Learn the Hebrew words used to train the dog in the story. Esty will read from her tween-pleasing novel about eleven-year-old Molly, who just wants to spend the summer with her friends at camp, but reluctantly heads to Israel to visit family she barely knows instead. Then Esty can lead an audience in an activity, from sharing ideas to even writing about their own life experiences. High-energy fun and creativity abound when Lisa Rose and her pup puppet visit and share her book. A community-building art project can also be included. Since she was a child, Linda dreamed of becoming a children’s book writer. She enjoys demystifying the writing process and making writing fun for children, bringing “show-and-tell” materials such as a rough draft (or “sloppy copy”), revisions, a book contract, editor’s comments, an uncut press sheet, color separation sheets, and her rejections (very popular with all kids!). She, of course, reads a book to the class and tells the story of how it came to be! Read together, talk about creativity, and practice imagining and telling stories. Children and adults can join Judy for intergenerational coloring projects. A professional artist specializing in ketubahs, Judy can create a special piece for your community to color in together and display with pride. Read this whimsical and funny re-telling of the Noah’s Ark story with the Rabbi Olitzky, and learn along with the animals how to go potty while on the big ark. Rabbi Olitzky is also available for adult programming and teacher training. An author and illustrator, puppeteer and ventriloquist, Karen Ostrove inspires children to explore the creative processes of writing and drawing through hands-on activities. All Jews arrived from somewhere, and not all of them came from Europe. Join author Ruchama King Feuerman, whose family lived in Morocco for centuries, to learn about the Jews of North Africa in a book reading and discussion. Barbara Krasner’s program What Would Goldie Do? inspires children to dream big and to help their communities. The program includes a reading of her story about Golda Meir’s first crusade as a fourth grader in Milwaukee, raising money to help her classmates buy textbooks. Children then engage in a game, What Would Goldie Do?, to demonstrate how one kind gesture can make a big difference. Using illustrations from her more than 30 published books as a starting point, Ann’s lively, interactive program describes the process of writing and illustration from the first word, to first sketch, to the final book. It includes a sketching demonstration, a grab bag of props and lots of other fun surprises! Using objects like real vegetables and magic wands to bring her books to life, Linda Marshall reads her stories while she interacts with kids, explaining how she plays with words when she writes her books. Kids will explore the fun, inventive side of writing books with experiences from their own lives! A dynamic presentation includes a reading and an art activity when children make their own puzzles, just like the story’s main character. A high energy and fun program–kids will be hopping about tikkun olam! Kids select their favorite hobby: jump roping, ball bouncing, singing, coloring, whatever–and use that interest to make the world a better place. Create a Take-Home Tikkun Olam newspaper, like in the book. After presenting this lovely story about how a mother and daughter share the urge to make the world a better place, audiences will participate in a related tzedekah activity that encourages children to know themselves and to do good in the world. Children and adults learn about the traditions, songs, customs, history and stories of the Sephardic, Mizrahi and Oriental communities in a multi-media format. “Outside-the-box” holiday celebrations include creating a Baghdadi-Indian Passover seder plate; ushering in the New Year with a Rosh Hashanah “seder;” taking a Purim trip back to the tombs of Esther and Mordechai in Persia; and welcoming Hanukkah with the Tunisian “Hag Habanot”: Festival of Daughters. $500 plus travel. Durga Bernhard helps children make Bible stories personally meaningful through writing and crafting. Create a story scroll or make stick puppets of your favorite characters, build a paper ark and your own cutout animals, write and illustrate poems, or make group collages that “talk” to the sun. 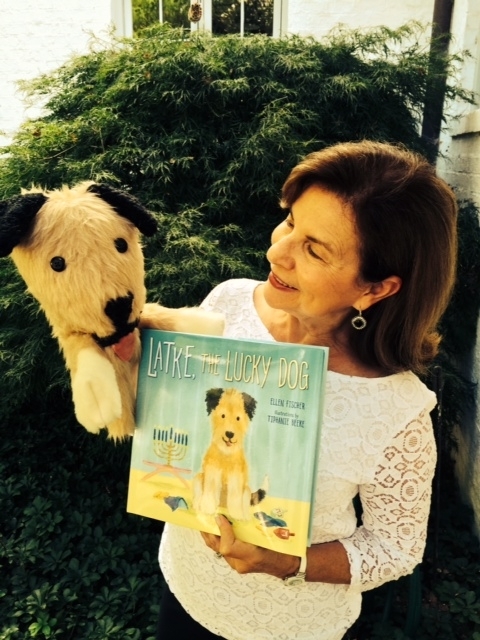 A dynamic presenter, Amalia Hoffman will share this charming book with help from its star—a cat puppet. The cat and dreidels will spin, tumble, balance, and hide, just like in the book. Children will participate by singing the dreidel song, coloring paper dreidels and counting them. For older children and adults, Amalia will explain why the number 8 is so important in the story of Hanukah. A veteran author who writes about interesting people and their histories, Krystyna will discuss her research process for the book. After a reading, students will be led through exercises to discover the most interesting parts of their own amazing biographies. Rabbi Leah Rachel Berkowitz is experienced at presenting to all ages, and can provide Shabbat-in-Residence programming for synagogues. Young audiences will create a story about a biblical character, like in The World Needs Beautiful Things, using writing, bibliodrama, photography or crafting. Using learning games to create an interactive program, Ellen Fischer gets kids excited about reading and learning about holidays. Maccabee: Tilda leads children in a vigorous retelling of the Hanukkah story with rhythm and rhyme that match the excitement of bold illustrations. A repeated theme allows listeners to participate and adds depth of meaning to the age old story. In conjunction with a student program, Tilda Balsley can include an afterschool workshop for teachers. Based on fluency research, this session shows teachers how to use rhyme and readers’ theater with students to encourage enthusiastic rereading. Prolific husband and wife duo bring the excitement of story crafting and word play to your group. Entertaining book reading with question- and-answer teaches children to play with words, anagrams and palindromes, and how to write short verse. (Grades PreK-6) $590/half-day, $850/full-day plus travel. Read together and discover the message of peace and being a good neighbor. After reading, we can discuss how we actually can all work together to make the world a better place, as well as do an activity that helps others to reinforce these values. Getting children excited about the wonders of poetry is the reason J. Patrick Lewis visits schools in the first place. Poetry that is fun and respects the music of the written word. Poems about animals, nature, people, holidays, everything under the sun - including limericks, haiku, riddles, shape poems, narrative poems, song lyrics and nonsense verse. $2,200/day+ travel, includes 4 presentations. Linda often visit schools and libraries to make presentations to young people ranging in age from pre-schoolers to high school seniors. Her speaking style is informal and encourages creative give and take with students. An experienced art educator and award-winning author of children’s art activity books, Judy Press stimulates parents and children alike. Along with a reading, Judy will encourage children’s creativity through making original, age-appropriate arts and crafts. Discussion and book reading on what trees do for us and what we can do for trees. Each child will plant a seedling in a cup and take home to re-plant in their yard. Children will be encouraged to take a picture of their tree every year to send to Edie! $250 plus travel. Interactive storytime with songs, finger plays, and flannel board activities. A Bible stories Powerpoint presentation is available for religious school assemblies. Jacqueline Jules is a librarian and teacher who can tailor presentations to individual needs. YA author Tammar Stein loves talking about her books, writing and what makes great literature. Learn about why Tammar decided to write The Six-Day Hero, and talk about heroes in your life. Suitable in a school library and public library setting, Jennifer describes modern Europe and then jumps back in time to Nazi-occupied Europe. I then discuss how I got the ideas for my books, and walk the students through the process of making a book from idea to the bookstore shelf. A fun interactive session led by experienced kids’ yoga instructors, in which children learn to “be” the Hebrew alphabet letters through yoga poses. Carolivia Herron, an African American writer (Nappy Hair) who grew up in Baptist tradition, spent forty years journeying toward her conversion to Judaism. One Shabbat, her father’s surprising recognition of the Hebrew candle blessing led Carolivia to recall this story of Jewish ancestry told by her Great Grandmother Olivia Smith. about her family’s ancestral Sephardic journey — from Spain, Portugal, and Italy, to Barbary Pirates, Tripoli, Libya, and the GeeChees on the Georgia Sea Islands. A Tale of Two Seders / Matzah Ball / Where Do People Go When They Die? Kids Program: Book reading, followed by a conversation with children about our families and the different ways we celebrate holidays at home. This program could be combined with an adult program in family education context. Adult Program: Book reading, followed by a presentation and discussion for parents, clergy, and educators about new family configurations (divorce, single parent, two moms and two dads, intermarried) in the Jewish community, and how rituals and lifecycle events can help our children and support their families. No fee in local area. Fee plus travel outside area. Deborah Lakritz, author, social worker, and mother of five, presents a unique program for grandparents and grandchildren. Based on her book Say Hello Lily, about a shy little girl who visits a nursing and makes friends with its residents, Deborah will have kids and grandparents interacting with one another, sharing stories about birthdays past and present, culminating in a very special birthday party. When Rachel misplaces her special hanukkiah, Nonna saves the day with a fabulous homemade replacement. Following a reading, children will use their imaginations to create their own hanukkiahs out of regular household objects. In a storytelling session, author Elisabeth Kushner will introduce young readers to the superhero she created: Nate the Super Alien! Children will have an opportunity to create and share their own superhero identities. International journalists Peter and Dagmar Schroeder present their role in the internationally known Paper Clip Project and address issues of tolerance in schools and communities. (Middle school through Adult) Honorarium plus travel. Yuvi’s Candy Tree, based on the true story of a little girl and her grandmother who make their way from Ethiopia to Israel, is exciting and amazing! Author Lesley Simpson reads the story and then offers children the opportunity to create their own candy trees and tell their own stories about growing up.